Used vehicles with new conversions ranging from rear-entry, side-entry and lift conversions on Ford, Toyota, Chrysler, Dodge, Mercedes and Honda vehicles. We provide a 134-point inspection on used wheelchair vans, guaranteed customer satisfaction upon delivery, nationwide delivery and no hidden dealer fees. 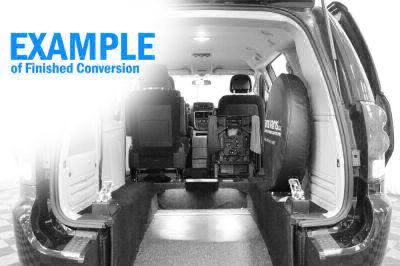 A pre-owned vehicle from AMS Vans is a gently used van with a new conversion applied to the rear or side for wheelchair access. The conversions tend to be on gently used vehicles with low miles and recent model years. You may also like our used inventory of wheelchair accessible vans, including many non-AMS Vans conversions such as used BraunAbility, VMI and Rollx wheelchair vans. Customers can always trade-in a vehicle for one they desire. Call a mobility specialist today to determine what conversion is right for your mobility needs (800) 775-8267. Showing 30 of 242 vehicles that match your search.